If you keep up on your tech news from The Next Web at all, you may have read Edmundas Balcikonis' recent piece on the Lithuania. We took notice, of course, as we are living and breathing proof of his point: that Lithuania is a secret tech powerhouse. We'd like to blow the lid right off that secret. 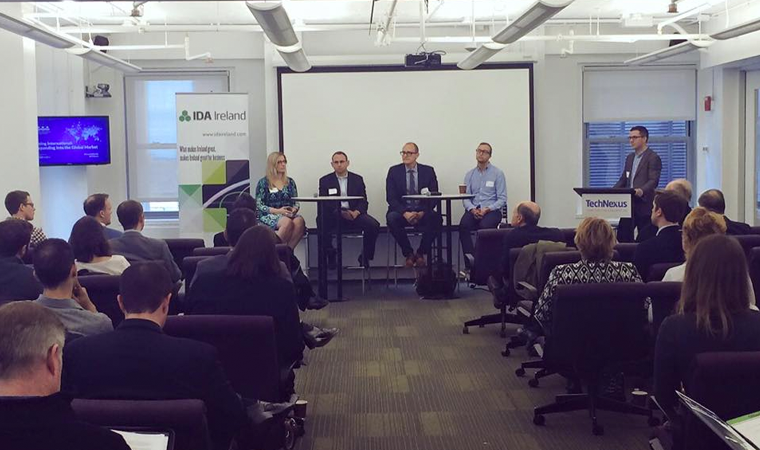 Here's Aurimas (2nd from the right), President of Devbridge, participating in ITA's Going International: Expanding Into the Global Market panel. Edmundas covers five basic categories of Lithuanian companies that are making noise globally, going deeper than just the most recognizable names such as Pixelmator and GetJar. Following in the footsteps of those two names are more promising startups in the tech space, in categories including SaaS, entertainment, Fintech, marketplaces and services. Here in Chicago, we focus on SaaS and development services as well as our work in not only Fintech but also the manufacturing, software, retail, healthcare industries globally. With offices in Kaunas and Vilnius, Lithuania, we take advantage of the "secret" pool of talent in Lithuania, which is not so secret to us. In fact, we employ over 100 people in those offices, in roles and careers that include not only software and web development, but design, management, quality assurance and operations. We are also dedicated to tech education in Lithuania, as illustrated by our Sourcery Academy program, which is available for Lithuanian students, and our partnership with Kaunas University of Technology for finding new talent. It's not just that we have offices in Lithuania, either. In our Chicago office, we interact daily with our colleagues in Lithuania. What's more, nearly everyone in the Chicago office has visited Lithuania at some point, and members of our team from Vilnius and Kaunas are regularly present in the Chicago office for weeks at a time. Not only are we experts in tech, but we also work effectively within globally-distributed teams, which allows us a global reach. We're also not the only Lithuanian connection in Chicago. Did you know that renowned CEO of Illinois Technical Association (ITA) Fred Hoch's wife is of Lithuanian heritage? Back in July, Mr. Hoch actually visited our Kaunas office on a trip to Lithuanian. You can read more about that trip here. With our recognition in excellence in tech from the W3 Awards, The Telly Awards, the Hermes Creative Awards as well as our Inc. 5000 and Best and Brightest recognition, among others, it's clear that we're doing something right. Like the companies mentioned in Edmundas' article, our success is a prime example of the Lithuanian tech powerhouse.